Playing the long game means experimenting with different training styles to understand how they’ll benefit you. But no matter how your lifting changes, there are a few basic principles that will apply regardless of what you’re doing. Here they are. 1. 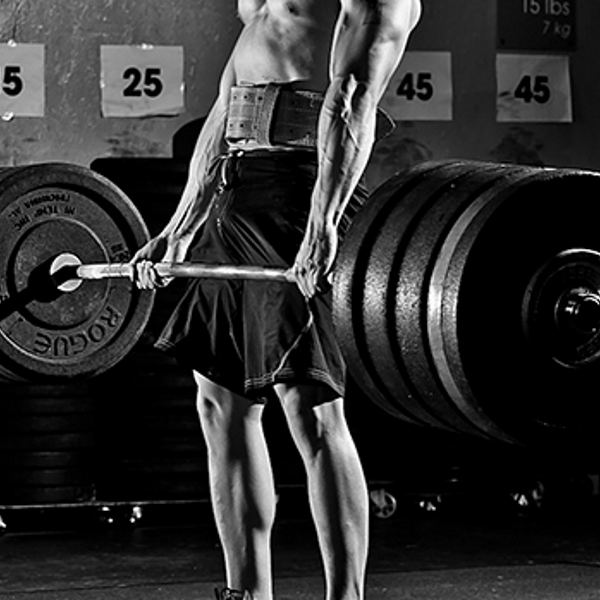 Use big compound lifts to direct your training. Base your training on big compound movements. For each lift, figure out which muscle is holding you back and add isolation or assistance work for these weak points. Use compound lifts not only as a tool to build muscle mass and improve muscle density and hardness, but also as a diagnostic tool to help you select which “muscle-building work” to add to your training. Even if you’re going for a specific look, train for performance on the big basic movements and the look will follow. Improve your performance on the strength lifts (squat, front squat, deadlift, bench press, military press, pulls) and Olympic lift variations. Don’t select assistance work blindly. Pick bodybuilding movements with the purpose of improving performance on the big movements. Choose exercises that address specific weaknesses found in your main lifts. By selecting exercises that fix these weak links, you not only boost performance, you also stop spending training “money” on garbage volume. If a muscle isn’t holding you back on any of the big lifts it means that this specific muscle is receiving enough stimulation from doing the big lifts themselves. Therefore, adding more work for that particular muscle isn’t a good investment. 2. Don’t train every muscle directly. Your body has a limited capacity to adapt to physical stress. The act of training requires energy and resources, two things that can’t be invested in growth if you overspend on training. You don’t need to train every major muscle directly or use the same amount of work for all of them. Not everyone needs a chest day, a shoulder day, an arm day, etc. By the same token, just because you’re doing 20 sets for your back doesn’t mean you need 20 sets for your biceps too. For one thing, the back is a lot more complex than the biceps – seven-plus muscles vs. two if you count the brachialis. And when you do most back exercises, you also train the biceps too. If your training is based on big compound lifts, most muscles are already receiving some stimulation without even doing isolation work. Because we all have different strengths and weaknesses, as well as leverage differences, some of our muscles might be understimulated when doing the big compound lifts because our dominant muscles take over most of the work. These same dominant muscles are receiving plenty of stimulation from the work they do on the big lifts. Adding direct work on top of that is unnecessary and could even be counterproductive, especially for the natural lifter. Work should only be added on an as-needed basis. Start with the big basics and only add direct work for muscles that needs some attention to make them progress at the same rate as the more dominant muscles. 3. Don’t train every muscle the same. When it comes to isolation work, not all muscles respond best to the same type of stimulation. Fiber dominance matters. Hamstrings are best trained with lower reps. Even when doing direct hypertrophy work, keep the reps below 10. This is mostly true of movements like leg curls and glute-ham raises. Exercises involving hip extension can be trained for higher reps since the glutes and lower back come into play. Quads can be trained for higher reps. As high as 20-30 reps can be effective. Pecs respond well to higher reps.
Triceps respond better to lower reps.
Delts generally respond better to high reps, though the front portion can respond well to lower reps. This is why delt-dominant bench pressers tend to have large front delts. But when training to get that rounded-shoulders look, higher reps of isolation work is best. This program will build yours. The mid upper back responds well to lower reps. Keep in mind that we’re talking about bodybuilding work here, so lower means below 10, not below 6. The traps are very strong muscles, but because of the short range of motion with most isolation trap exercises, you need higher reps (15-20) to make them grow fast. Biceps are best suited for intermediate reps. High reps tend to make them look flatter once the pump subsides, but very low reps aren’t effective at stimulating maximum growth. The number of sets per exercise doesn’t need vary between the muscles you’re targeting – we’re talking about more isolated work for a muscle. Do 3 or 4 sets per exercise most of the time, regardless of the number of reps per set you’re using. 4. Forget the inverse relationship between sets and reps. Many think that the fewer reps you do per set, the more sets you should be doing. For example, if you do sets of 3 reps you should be doing 5-10 work sets, whereas if you’re doing sets of 10-12 reps you should keep the sets to 3. But it’s not that simple. Adding a set presents a stress, and adding sets to an exercise is more stressful than adding reps to a set. Think about it: are low-rep sets less stressful than higher rep sets? Energetically speaking, maybe (you’re burning more glycogen with higher reps), but doing lower reps with heavier weight places a much larger burden on the nervous system. It’s a mistake to evaluate how demanding a set is solely based on how much energy you expend. After all, restoring glycogen after a workout is a simple process, and it’s fairly rapid. However, neural recovery is a much longer and harder process. Why would it be logical to do a lot more sets of something that’s significantly harder on the body just because it uses less fuel? When you look at typical high-rep bodybuilding programs, 4 sets per exercise is pretty common. So the clear inverse relationship between the number of reps per set and sets per exercise is not so clear. Furthermore, if you look at some strength programs based on a high frequency of low reps for each movement you’ll see that not all low-rep programs use higher sets. For example, Sverre Diesen recommends doing 2 sets of 5 reps on the powerlifts five times a week, an approach that you often see in the work of Pavel Tsatsouline too. And what about Jim Wendler’s 5/3/1 which uses 3 work sets for the main movement despite using low reps? Or Ed Coan, maybe the greatest powerlifter of all time, who used 2 or 3 sets per exercise even when using low reps.
You can also find many effective muscle-building programs doing the opposite of the rule. The best example is the 10×10 system in which you do 10 sets of 10 reps on one exercise, which is the exact opposite of the rule. You also have Arnold who often did 5 sets of 12-15 reps per exercise. He turned out alright. Sure, there are plenty of examples of training that uses a high number of sets for a low number of reps. But when selecting the number of sets you do per exercise, consider the overall impact of a set, not just how much energy you expend. 5. Do no more than four intense sessions per week. Most people can only handle four intense training sessions per week. An intense workout has a systemic effect that impacts the whole body, not just the targeted muscles. A tough workout will fatigue the nervous system and challenge the immune and hormonal systems – the latter two being responsible for the actual hypertrophy response to training. The immune system is responsible for the macrophage/cytokines and satellite cell activation part of the muscle-building process, which is necessary to initiate repair and growth. The hormonal system plays a role in protein synthesis by having anabolic hormones (testosterone, IGF-1, etc.) higher than the catabolic hormones during the recovery period. If the immune and hormonal systems are constantly challenged you can’t build muscle optimally – and you’ll be more likely to get sick or suffer from low libido and depression. A drained nervous system means your performance and well-being will suffer. A hard session challenges all of these systems. Too many of these workouts in a week leads to stagnation. You can do a blitz phase of about three weeks in which you have more intense sessions per week. But you can’t do that for the long haul, and once the blitz is done you’ll need a deloading period to be able to continue progressing. This doesn’t mean you can’t train more than four days per week. It means complementing the hard workouts with less demanding sessions. If you like to train almost every day, you can do four hard sessions and add two or three less demanding workouts. For me, these will either be neural charge sessions or low-volume bodybuilding/isolation sessions of lower weight and higher reps. In these workouts I don’t go to failure and find that they actually help me recover and prolong the growth period from the previous hard session. Sometimes we want to progress so badly that we make counterproductive decisions. Having more than four hard sessions per week is one example. You can train at a moderate level six days a week too, but these workouts are hard to calibrate properly and can be unrewarding. If you plan on training really hard, stick to the four-per-week rule. 6. Stop putting an unnecessary time-cap on your workout. The energy demands of a workout are related to the volume of work done, not the duration of the session. Someone who does 30 sets of 10 reps in a 60 minute workout will burn more fuel than someone who does 15 sets of 10 reps in a 90 minute workout. The first guy will end the session with a higher cortisol level than the second one, even if the workout was shorter. But a lot of coaches have been preaching the value of keeping workouts under an hour. They often cite Bulgarian lifters who divide their daily training volume into several 30-45 minutes sections. They say this scheme is designed to optimize the testosterone to cortisol ratio, and that training for longer depresses testosterone while increasing cortisol. The problem? That logic comes from a weightlifting country that has been disqualified from international competition several times because their whole team (or almost) failed drug tests. Call me cynical, but I have a hard time buying the “we want to keep testosterone levels high” argument when it comes from athletes likely injecting ten times the physiological dose of testosterone weekly! Antonio Krastev even went on record saying that Abadjiev decided to segment the training so that he could better control the lifters whereabouts when they were in training camps, and that maintaining optimal hormonal levels had nothing to do with it. It’s the volume of work that plays a greater role in the testosterone to cortisol ratio post workout. Cortisol is released during training so that it can help mobilize stored energy to fuel muscle contraction. The more energy you need during a session, the more cortisol you’ll release. Now, excessive training VOLUME can impair mTor activation. Elevated cortisol is itself something that blunts mTor activation. And so does glycogen depletion. Depleting glycogen stores increases AMPK levels which itself turns down mTor. Remember, mTor is the switch that turns on protein synthesis (muscle building). So it’s true that doing too much training volume in a session can hurt your gains. But it’s not the training duration itself that’s responsible. Some of my workouts can last 90-120 minutes. This happens when I have two different Olympic lifts in my workout and I have to do ample warm-up sets to get my technique solid for the day. But none of these sets use a lot of glycogen since they last less than 10 seconds. So even if my workout time is long, it doesn’t mean that my hormonal milieu will be catabolic. Furthermore, using Plazma™ pre and intra-workout can prevent the negative drawbacks of volume. First because you have glucose readily available in your blood stream, which means that you don’t have to release as much cortisol to mobilize fuel. And the carbs it provides protects the glycogen stores. If the glycogen stores don’t get depleted as much during the session, the risk of turning off mTor are much lower. While Plazma will allow you to do a lot more volume of work without negatively affecting the testosterone to cortisol ratio, there is still a limit to what you can do. But that limit has to do with volume; training duration is only an indication of the volume and isn’t itself the cause of the problem. The 45-60 minute limit simply allows a lot of personal trainers to fit more paying clients into their day. Don’t try to extend your workouts to several hours, but think in terms of volume rather than training duration. 7. Vary neurally intense exercises. The more neurally intense something is, the more you need to vary it. When you train very heavy on a movement you need to change that exercise frequently – after three weeks if you stick to around 90 percent of 1RM, and every week or two if you go closer to 100 percent. When using the maximum effort method you need to change the specific exercises often. Change to slight variations of the exercises either by varying grip, stance, bar type, or the conditions you’re performing the lift in (tempo, pauses in the movement, using chains, etc.). When you’re using a strength-building model based on perfecting a specific movement in which you stick to the same exercise several times a week for multiple weeks, you need to train at an intensity that’s not demanding on the nervous system. That allows you to stick with the same exercises for a lot longer. The maximal effort method will build strength through better muscle fiber recruitment, increased firing rate, and inhibition of the protective mechanisms. Since it’s neurologically demanding, you need to vary the exercises often to avoid habituation, which leads to stagnation and even regression. The frequent effort method will build strength by improving technical efficiency as well as intra and intermuscular coordination. For it to work you need to repeat the same exercises often and stick with it for longer. But to be able to do that you can’t train at a level where the nervous system is overloaded. That means avoiding training at and above 90 percent. Doing work in the 75-85 percent range with submaximal reps will allow you to be able to train a movement often and for longer before hitting a wall. It’s important to understand how each training style works and how you should plan your workouts to avoid habituation if you want to progress over the long haul and reach your maximum potential. Both the maximal and high frequency approaches have their place in a training regimen, but they shouldn’t be used at the same time.